Looking for a harpist for your wedding, party, or other special event? Harp music can add a touch of elegance to your wedding ceremony or reception. A consultation and 1-2 special requests of non-standard repertoire are included in the wedding package. Clients can choose between solo harp, solo flute, or a mix of both instruments at no additional charge. Lisa has experience providing background music for a variety of events, including weddings, Sunday brunch at restaurants, art gallery openings, receptions, and assisted living/senior center events. Lisa has performed at holiday parties for Tiffany & Co. and for the Texas Secretary of State. Lisa is also available for hire to play at church services, in orchestras and bands, for school programs, and as a studio musician for recordings. 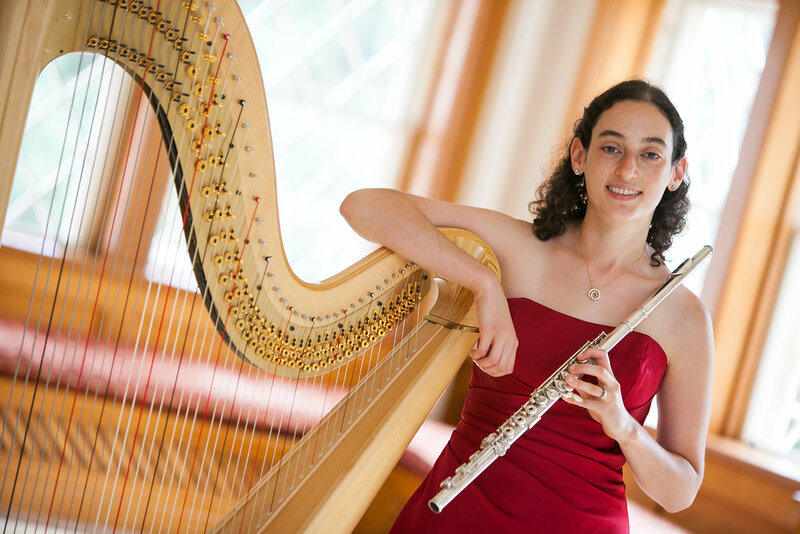 She has played at several churches in Austin, Round Rock, Georgetown, and San Antonio and with the Austin Symphony, Austin Symphonic Band, and Austin Wind Symphony. "My family and I would just like to say thank you for a job well done! We were so pleased with your wonderful services at our wedding and we have received so many compliments on the music selection and your great performance." "Hearing your beautiful music as I walked down the aisle was truly unforgettable. I'm sad that I only got to hear two songs! I also know the guests were in awe and absolutely loved you." "THANK YOU for your AMAZING MUSICIANSHIP!!! WE were so LUCKY to find you!!" "I have absolutely no doubt that the artistry of Ms. Lisa Lamb contributed greatly to the beautiful, serene, intimate wedding ceremony of my daughter and son in law. It was absolutely beautiful...we could not have been more pleased. I highly recommend Lisa to anyone considering a harpist for their next event...she will not disappoint. She was fabulous!!!" Lisa also performs with the GlyssWynde Flute and Harp Duo. Click here for information about hiring the duo for your event.